For as long as she can remember, Ashley Rivera wanted to be a singer. When she was in pre-school, she recalls her teacher, Miss Angela, asking what she wanted to be and she said “a singer” and Miss Angela and the kids clapped for her and she knew it was possible. Ashley looks like a rock star – dark hair, slight figure, mesmerizing eyes. The first time I saw Ashley sing, she was the front for a cover band and was all of 23 years old; her soulful and yet rocking voice and stage presence went far beyond her years. She has spent a number of years singing with cover bands and doing studio work in Nashville and Atlanta, but her heart is for her original music. As she got older, Ashley was introduced to rock music and knew that was where her future lie. The first album she got was No Doubt’s Tragic Kingdom which she says her “cool aunt” bought her instead of the Spice Girls she wanted. While she did eventually get that Spice Girls album, her aunt opened up her consciousness to a different kind of rock. As she grew up, she uncovered a passion for rock music, including the likes of Led Zeppelin, Fleetwood Mac, and David Bowie. Now she is fronting a new band, Sister Moon. She still does the occasional cover band gig, but her heart and soul lie with the original music that Sister Moon is creating. Sister Moon, started in 2017, has a unique sound that is a combination of rock, blues and haunting melodies. The band is made up of guitarist/producer David Rowe, drummer Gary Stone, bass player Lee Banks, with Ashley on vocals. They had all played together separately in different combinations over the years, and decided in 2017 to pull together and form Sister Moon. 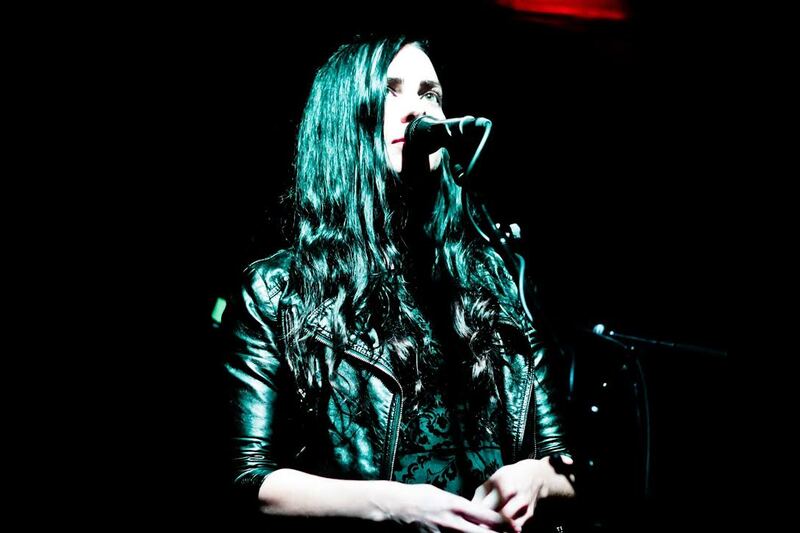 Ashley describes the music as Southern Gothic with a lyrical focus on magic and dark themes. Listening to the song, one can hear it tell the story of lost love, beginning with a dark, hurtful perspective. The corners are where the pain hides. The band expects to release additional singles over the next few months and potentially an EP before releasing the song collection as a full album. In addition to their work together with Sister Moon, Ashley and drummer Gary Stone co-own a studio in Madison, GA which they began building out about three years ago. The remote setting is perfect for the studio. “It seems like you are driving into the middle of nowhere and when you go there it is literally on the edge of Lake Oconee. It’s a great set up, but it’s off by itself, which is great for writing and recording. You can be as loud as you want, you’re at the lake, you have your coffee, you start writing and it’s great.” They have a couple of projects coming out the studio over the rest of 2018 that they are excited about. Ashley recently moved to Athens; however, you will often find her in Atlanta area hang outs. 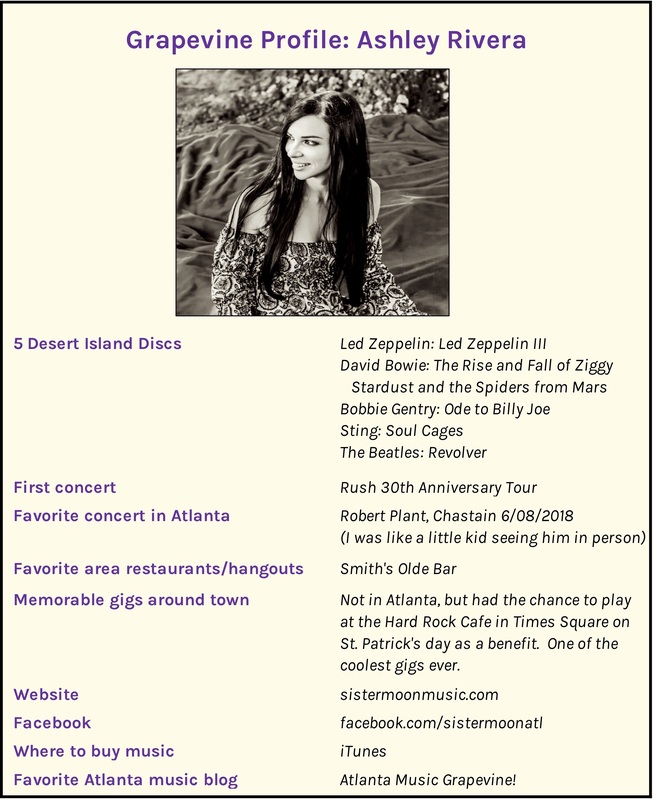 She hosts a monthly open mic night at Atmosphere’s in Loganville and she and Gary play together acoustically around town. 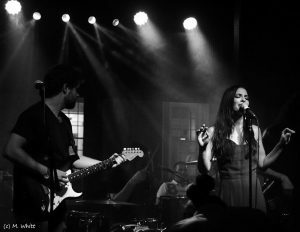 She likes to play at Smith’s Olde Bar, where she says it is obvious that they are trying to do the music right, from the sound systems to the lighting it is built with the music in mind. She also works with a few cover bands and does some studio work when she can. With her wide vocal range, enchanting voice and a knack for soulful storytelling that is now gelling with new bandmates, Ashley Rivera has lived up to her preschool aspirations of being a singer and so much more. 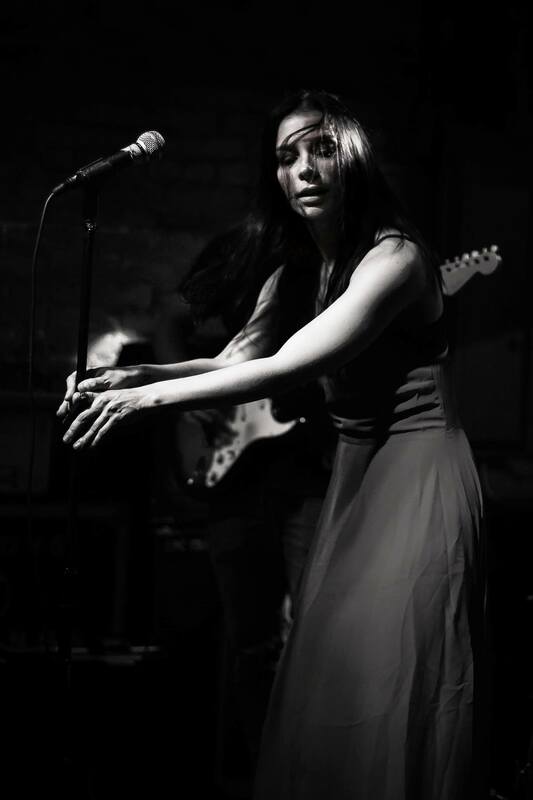 Sister Moon’s next performance is at the Velvet Underground at the Hard Rock Café on June 22. They will be sharing the bill with Last Chance Riders and Tyler Lee Frush. Tickets to the show available here. 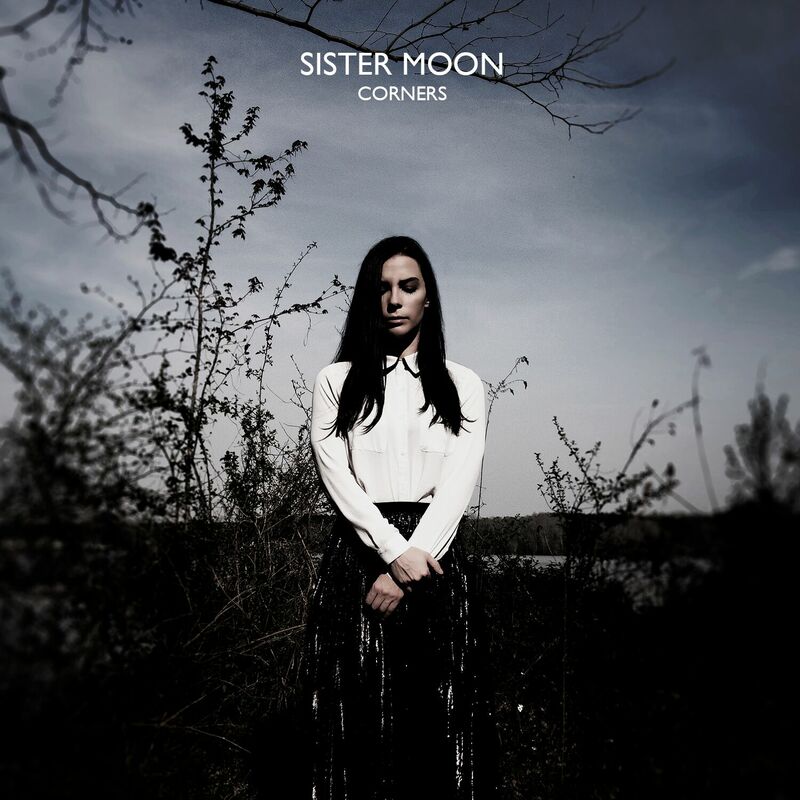 You can find Sister Moon on all of the streaming music sites and buy their single on iTunes.